A flip through Brian Rea portfolio shows typographic illustrations and chicken scratch line drawings packed with Zeitgeist-y punch. Whether laid out in mural form, printed in a magazine, or worn as clothing design, his art is the sort that a viewer can’t help but stop and contemplate for a moment. During his career, Rea has been the Art Director for The New York Times Op-Ed page, he’s created pieces for book jackets and film posters, as well as being a featured artist in magazines including Time and The Atlantic Monthly. Rea has also completed more than his fair share of art within the realm of fashion boasting Kate Spade and recently Marni as partners. The end design product born from the latter project, which sees Rea’s drawings printed on shirts and handbags, tops our FW12 favourites list, and begs the question: who wouldn’t want a shirt depicting a tranquil giant peeking in Spiderman style on a bell-shaped bookworm? Very few we think. Rea’s illustrations are not romanticized by excess color or line marks, they are quiet in composition, as they are in their subtle melancholy. A whimsical visual storyteller; the artist’s sketches are witty, endearing, and brilliant in their simplicity. For Marni’s current collection, Rea amplifies the jolly of Marni’s playful designs by way of a glimpse into his rare jellybean imagination (think serious meeting between penguins and a girl) with a selection of prints that will have all who wear it, attracting curiosity and smiles from passersby. An obvious observer of pop phenomenon and the quirks of everyday life, Rea’s art is infused with a rare sort of accessibility. An artist who believes that “anyone who puts all of themselves into their work is an artist in some way,” below, Rea discusses art’s place in fashion, and fashion’s place in the world of art. What brought about your collaboration with Marni? 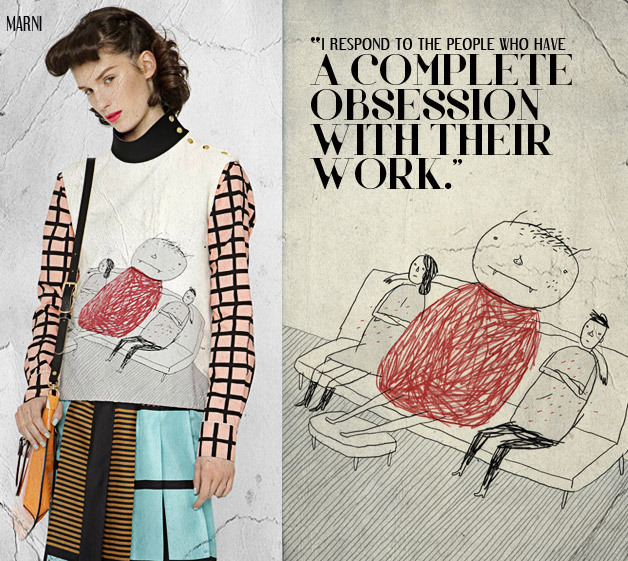 Marni has been collaborating with artists the last few years – Kim Gordon, Gary Hume, Peter Blake among others. When they saw my drawings for the “Modern Love” column in The New York Times, they reached out. What is it that attracts you to the fashion industry? Is the appeal different or similar to the art industry? Within both, I respond to the people who have a complete obsession with their work. People who take things further and reveal surprising little gems. The difference though is that I’m further away from the fashion industry — but that’s also an appeal — I have so much to discover. Well you’re off to a great start! In collaborations like this, do you believe the line between artist and designer becomes blurred to form a unique amalgamation, where one’s creative vision is adjusted to better suit the genre? I think some collaborations at times require this, though I would say, our collaboration was a result of Marni seeing and trying something new with my work. Though I’ve always had it in my head to someday do something in fashion, the context never seemed quite right. In this case, I provided a story that seemed suited to the tone of the work they were creating. Nothing was blurred or adjusted. How was it working with Marni’s creative team? Was it you, or the label that had to compromise more during the design process, or was it a fairly equal-sided collaboration? Completely equal. I can’t say enough great things about Gloria and Consuelo. They’re rockstar sweethearts. There really is a beautiful harmony to the collaboration. What are your views on fashion as a form of art, in other words when does it become art, or do you not believe fashion ever crosses over into the realm of art? Anyone who puts all of themselves into their work is an artist in some way. I don’t care if you’re drawing, surfing or hemming a pair of pants. There’s an art form to all of it. Sometimes the end result is a product, sometimes it’s in the performance itself. The same could be said for the designer of clothes and the person wearing them. Some of the most artistic things I’ve seen in fashion had less to do with the clothing, but rather with how they were worn. That’s very true, often it’s how the fashion is worn that seems more artistic than the fashion itself. As an artist, what is your opinion on fashion exhibits that are displayed in art museums, does fashion have a place in galleries? Sure, but context and curating is so under acknowledged when it comes to organizing an exhibition. A great curator can put together a killer fashion exhibition, and I would totally go see it. But for me, the best “gallery” for fashion will always be the street. Skirts just look better on a woman than on a wall.